Team Mojo Yamaha tuner, Larry Cook. It’s taken a couple of days to get over the Island Classic weekend and the long trip home but there was a cool change last night, a relief from the unremitting heat of the last two weeks and I’m feeling just about up to par. As noted yesterday, the Island Classic delivered again as it usually does and I’ll try and take you though the highlights (and some lowlights) and document the Australia Day weekend as I saw it. Unlike previous years (this year was my 8th Island Classic) I travelled down in the car and Helena came with me. Not to go to the races, you understand, the plan was for me to go see the races and for her to see, shop, swim and sketch. She took a large amount of art gear with her and was more than able to stave off the boredom with all four of the mentioned activities. We took 2 days to get down there as Helena isn’t a big fan of endurance driving. The traffic on Wednesday was appalling, Christmas holidays and all. Whereas you usually run out of it by the time you get around Milton, it was still heavy and filled with bozo drivers until well past Narooma. The weather was hot (35 degrees plus outside) but the Toyota has great air-con so it was only really a problem when we stopped and got out of the car. The plan was to do the Princes Highway all the way and that turned out to be a bad call, but we weren’t to know that. 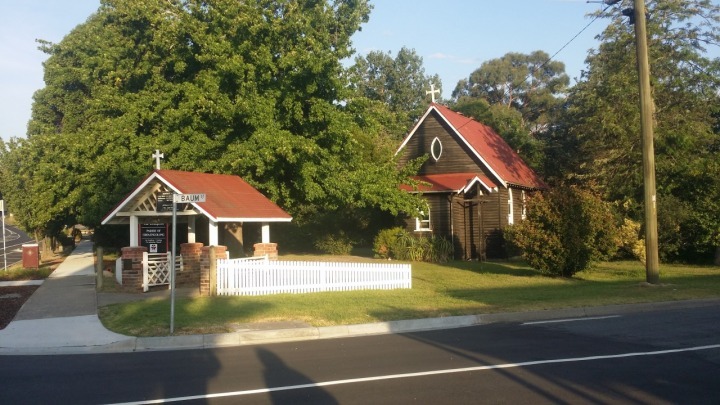 Cann River Hotel for our overnight stop and then into the dreaded “Drowsy Drivers Die” territory of Victorian roads on Thursday. The Princes badly needs upgrading but, try as I may, I can’t imagine why VicRoads has chosen to do it during the Christmas holidays. Maybe a third of the run between Lakes Entrance and Traralgon was disrupted by miles and miles of 40 km/h speed zones, dozens of Stop/Go men and women and overtaking lanes that were closed while road works was being done. Throw in dozens of wobbleboxes, boats on trailers and dozy Victorian drivers and it was a nightmare. 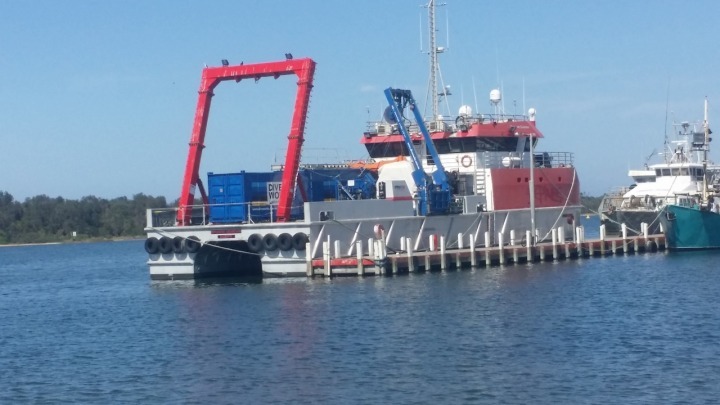 Impressive looking boat in the harbour at Lakes Entrance; ocean survey or something? A stop at the Tourist Information office along the way revealed that there was a better route to the Island that would get us off Highway 1 and onto some decent roads. Cut left just after Traralgon onto the Strezlecki Highway and onto a glorious road that was virtually deserted and which dropped us out at Inverloch, just 40kms from the Island; why haven’t I discovered this road before? Finished in black, carbon fibre wrap, the bike looked mean and purposeful and I christened it “The Stealth Suzuki” However, the first two sessions revealed that all was not well. GSX1100 engines are now over 40 years old and were never really intended to be hogged out to nearly 1300cc. Keeping the oil IN the engine at racing speeds is a problem and the Suzuki motor was hemorrhaging badly. Spirits could not have been lower. However a quick call to Scott Owen who had originally built the motor saw help on the horizon. 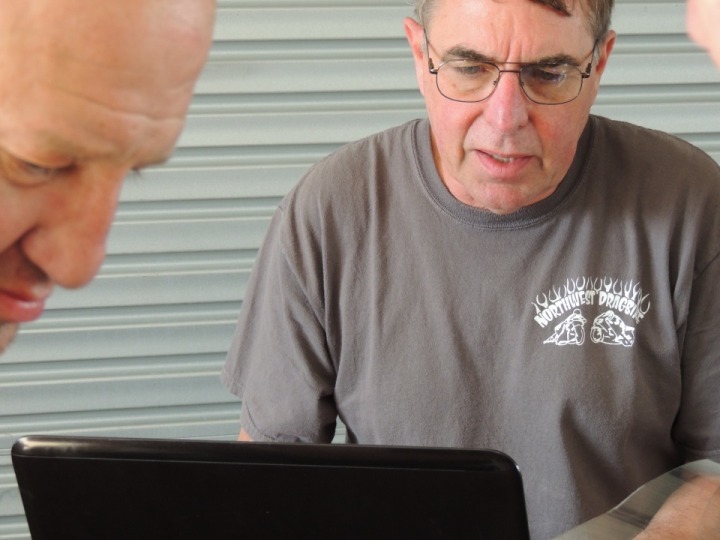 The bike was loaded on a truck and taken back to the SORD headquarters in Melbourne where a full tear-down and rebuild of the engine took place. All surfaces were cleaned again and all new gaskets were fitted including replacing the paper base gasket with a copper one. The bike arrived back at the track at 0600 on Friday morning and, relief upon relief, ran flawlessly for the rest of the weekend. It was then up to Jorge to get up to speed and he improved his times every session right throughout the weekend. The only problem the bike had was in Race 4 on Sunday afternoon when a coil wire snapped leaving the engine running on two cylinders. By that stage Jorge had impressed us all and the disappointment of not finishing the final race was muted considerably with the knowledge that, for a privateer bike and an unfunded team, Team Texas had covered themselves with glory. I was so thrilled for Paulie and the gang, having been party to the whole process over multitudes of telephone calls and video calls. Nice guys don’t finish last. We didn’t win but we exceeded all of our expectations. A wonderful team effort. Thursday had been hot, Friday morning was insufferable. By mid-morning the temperature was already 41 degrees and this was qualifying morning. Up and down pit lane there were stories in every garage but, quite by accident, THE story of Friday was another one with which I had been intimately involved. 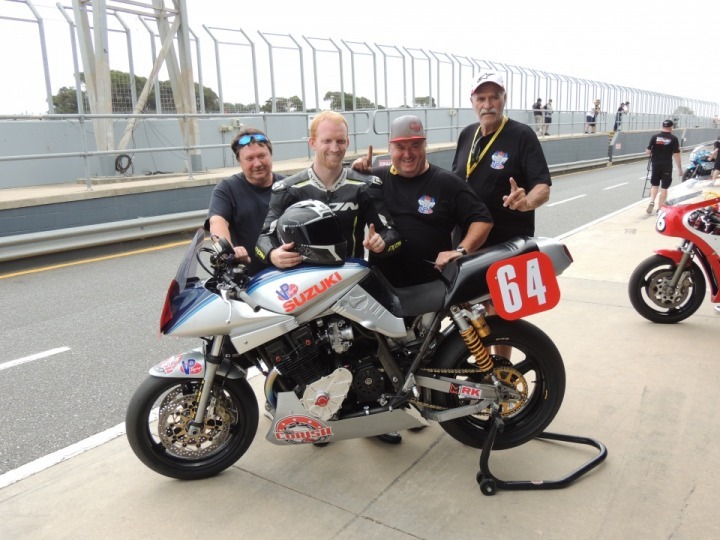 Aaron Morris, 26 years old and a member of the illustrious Morris road racing family, was booked to ride a Suzuki Katana. I actually knew quite a lot about this bike because its owners are the Corish brothers, Les and Glen, who run a chain of supermarkets not far down the coast from where I live. Glen is a speedway competitor and I have gotten to know both of the “boys” through speedway. Suffice it to say that, earlier last year, I started to get regular telephone calls from Les informing me of progress on the Katana they were building for the island Classic. The basic bike was the one ridden by Shaun Giles two years ago but it had a brand new Trevor Birrell motor in it plus a multitude of improvements and tweaks throughout the bike to bring it “up to speed”. 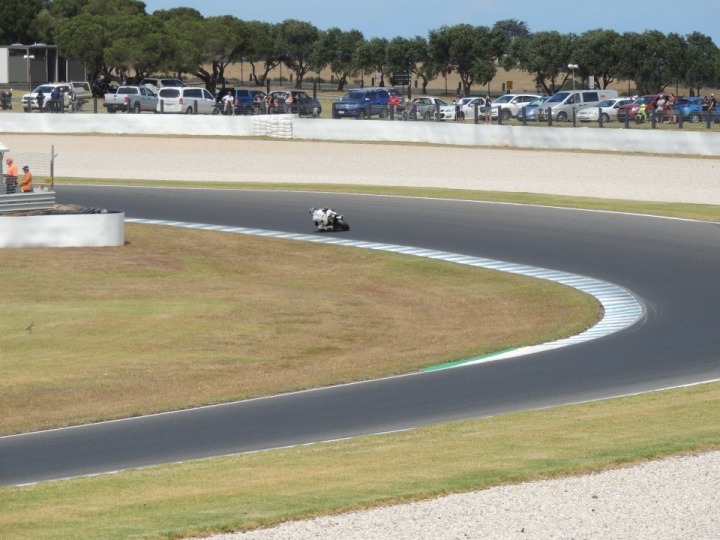 A very encouraging private test at Eastern Creek had the boys VERY excited about their prospects at PI. Morris was immediately on the pace, stamping himself as a VERY likely lad come qualifying time. And so it proved to be. He put the bike on pole with relative ease and the team sat back to see what the weekend would now bring. (l-r) Glen Corish, Aaron Morris, Les Corish, Greg Kelly. As always, there was a fascinating back story. If you know much about Australian road racing the name Corish is probably ringing a bell. 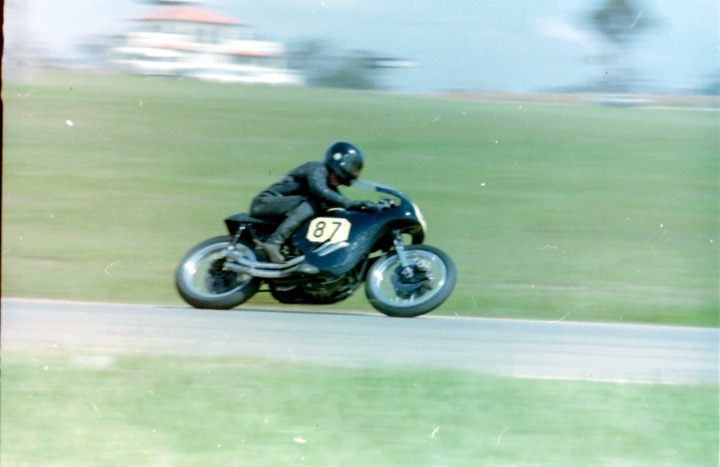 It was Keith Corsih, the boys’ dad, who built the famous Corish Vincent that was raced with huge success in the late 70’s by Eric Debenham. And Keith passed away on Australia Day 1990. Aaron putting the Corish bike on pole the day before Australia Day was especially significant for the team. But better was to come. On Saturday, Aaron won BOTH IC races, with ease to further cement the importance of the weekend for the Corish family. Were they happy? Hell, yes, they were. In the Team USA pit, the one where I spent quite a lot of time, as always, there were smiles all round. Team boss, Dave Crussell, himself recovering from serious injuries at the Manx earlier in 2018, had built and recruited well since IC 2018. A bunch of new CMR-framed Yamahas to be ridden by a mess of ex-AMA superbike riders, led by 4 times AMA #1 plate holder, Josh Hayes. Added to them was the return of Jason Pridmore, again on the Ralph Hudson CMR Yamaha, and Team USA’s stakes were looking great. The only blemish on the plate was a nasty crash for Steve Rapp when the throttle jammed open, leading to an overnight rebuild session by his crew led by J J Matter. At almost exactly 1300 on Friday the much-awaited southerly change blew in, dropping temperatures by nearly 20 degrees in less than half an hour. The next two days would be cooler and much more pleasant and the whole pits breathed a huge sigh of relief. Since this is not intended to be a full race meeting report I’ll leave it at that and pick up on the two days of racing tomorrow, still lots of stories to tell.